Single vision lenses are distance or reading glasses. 90% of the lenses sold in the Netherlands are plastic lenses. Sometimes, lenses of mineral or specially hardened mineral lenses (for safety glasses for instance) are still supplied. 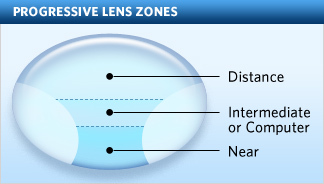 The index of the lenses determines the thickness and the image quality of looking through the lenses. There are several coatings for lenses. Consequently, AR coating, dirt and water-repellent coating or hard coating can be applied to lenses. These coatings have a specific function and can be applied to almost all lenses. AR coating ensures that the lens does not reflect anymore. As a result, others can see your eyes better, but more importantly; it keeps reflections from your image. You see more contrast and have a clearer picture because of this. AR coating consists of several layers with their own colors that you can hardly see. Hard coating makes the lenses more scratch-resistant. Often, this layer is applied to plastic lenses. These are not as hard as glass, eventually making them tarnished and scratched if they lack such a coat. Even after the hard coating, glass lenses are harder. Hard coating can also be applied to glass lenses, but it is usually to protect the other coatings. A multitude of combinations is possible based on the type of lens, index and coating. In order to respond effectively to a variety of correction possibilities, Iris Optiek offers a wide lens program. In theory, a few tens of thousands of different combinations are possible to achieve the desired vision correction. The lens program of Iris Optiek consists of unifocal, bifocal and multifocal lenses in various strengths. The lenses are made ​​of glass (mineral) or plastic (organic) and can optionally be equipped with color, AR or hard coating. Multifocal lenses have three invisible viewing surfaces that blend into each other so that a clear vision, both near and far, is guaranteed in one lens. Multifocal lenses are an example of advanced optical technology. Adapted to the individual wearer, they give great satisfaction. Sometimes, however, practice is necessary before one is used to the multifocal lenses. Multifocal lenses are absolutely the best lenses to maintain perfect vision at all distances. Those wearing them regularly can hardly do without these high-tech lenses. Those wearing them, however, are better off being aware of a few things so that they can get maximum satisfaction from their glasses with multifocal lenses. Multifocal lenses come in different qualities and they therefore differ in prices too. When choosing the right multifocal lens, it is very important what you want to do with it. What are you going to use the glasses for? What are your tasks; do you work with the computer a lot? It is mostly the laptop or maybe just the desktop? What is the strength of the glass? The distance-strength and the supplement for reading are very important. There is already a multifocal lens including AR coating and hard coating from € 98.00 a lens. The newest type of multifocal glasses with the best possible image for distance, in-between distance and reading are approximately € 400.00 a lens. You see a big price difference, but also a big quality difference. If you would like a good multifocal lens advice for FREE, please stop by the store and see one of our advisors.